Miccosukee Resort and Gaming, Miami. Rates from USD139. 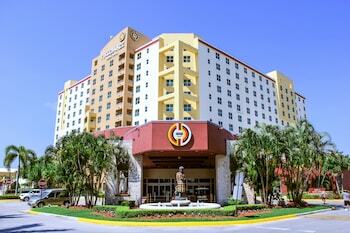 Miccosukee Resort and Gaming is a charming 3-star hotel located 8.9mi (14.3km) from the center of Miami. Guests of the hotel will have easy access to Gator Park. Miccosukee Resort and Gaming boasts 302 fully equipped, air-conditioned bedrooms. Hotel customers are offered the following room facilities: multi-line phone, in-room safe, coffee/tea maker, clock radio and voice mail. Rooms are equipped with iron/ironing board. In addition there is minibar and blackout drapes/curtains in the rooms. Beds: Rooms are also equipped with extra towels/bedding items. Guests of the hotel may request a rollaway bed and a crib/cot (infant beds). Bathroom amenities include designer toiletries, makeup/shaving mirror, bathrobes, shower/tub combination and hair dryer. Entertainment: The in-room entertainment facilities at this welcoming hotel include video-game console, cable television service, premium television channel(s) and pay movies. Internet connection options: Guests are sure to appreciate wireless Internet access. An additional charge is applied for wireless high-speed Internet access and Internet access. Housekeeping services are also offered. Food options at Miccosukee Resort and Gaming include a restaurant and a cafeteria. Breakfast is available (additional charge). Our hotel provides a 24-hour front desk service. For guest convenience, there is also an ATM/banking facility available. Multilingual and attentive hotel staff is at your service. In addition there is patio, hair salon and gift shop/newsstand at the hotel. Leisure amenities: Guests can also enjoy the following spa/wellness facilities: sauna, on site spa services, spa tub. Other available services: wedding services, laundry facilities, elevator/lift, concierge, complimentary newspapers in lobby and coffee shop or café. The hotel offers transportation to/from the airport free of charge. Making your reservation in Miccosukee Resort and Gaming is easy and secure. Simply select your dates of stay and click on the “Check Rates” button to submit the form.